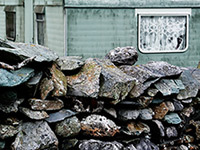 I have a thing about old caravans, but this shot is more to do with texture and colour than it is the caravan itself. In this instance I particularly like the contrast between the sharpness and irregularity of the wall and the muted greens of the caravan itself. On another note: updates may be patchy or non-existent next week as we're finally moving house on Monday, so a) things will be a bit hectic (probably for months to come), b) we won't have ADSL for at least a week, and c) I only have a one or two shots left to put up. I may manage to take something over the next couple of days and get them uploaded (unlikely), or I may manage to take something after we've moved (but will then have to upload via dialup). Either way I don't think that an image-a-day is all that likely for the next week or so but I'll see what I can do. Good luck with the move - hope all goes smoothly. colours and framing on this one are exceptional. hope the move goes smoothly..
Love the lights and darks in this photo... Good luck with the move! I like this shot because it echoes the situation with the scammers stealing other peoples work. The rock wall representing the barrier one has to build to prevent others from getting in and stealing stuff; in your case the images and in Daily Dose of Imagery's case, the code. Good luck with the move. This photo is incredible. I like very much the colors and light of this piece. I personally think the white balance is a little off. It's a tad bit too much on the cooler side. I would also have cropped maybe 1/5 of the bottom portion out. Nice texture. Tin: the colours are reasonably faithful to the original scene. That said, I applied a reasonably strong 'S' curve to the image (to bring out the detail in the wall) and then needed to desaturate the caravan, but I didn't deliberately 'cool' the image, nor do I think the white balance was off. The G5's auto mode is normally quite reliable under normal lighting conditions. the G5 is also my carry-around camera. i consider it to be always a bit on the cyan side under overcast conditions. i find this image to be a little bit on the cyan side too, especially in the 'white' areas. reduction of cyan would also bring a little more out of the brownish/reddish tones that i see in some areas in the image. Tin: much as I hate to admit it, you're absolutely right. I've posted a new version here that was amended by i) using the Curves too to set the white point (on the frame around the window), and ii) using Selective Colour to drop the Cyan from both the Blues and the Cyans. And you're definitely right, this is a much more naturalistic shot. All that said, I still think I prefer the original as, IMO, it has a bit more atmosphere. It always complicates matters when I do this, but I've replaced the original image (which can be seen here) with a hybrid version of Tin's suggestion (which can now be seen here) and the original. Does that make sense? The new version, IMO, corrects the colour cast and retains some of the atmosphere of the original. The rocky wall is terrific, and the frilly curtains make me smile for some reason. I love the color adjustment. Much warmer, and does a better job of drawing contrast between the foreground and the background.